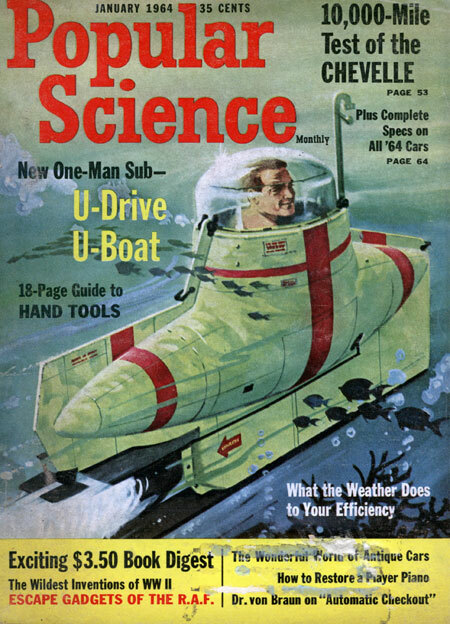 It's almost a half-century later... and we still don't have that personal one-man sub! Or domed cities on Mars. Or cars with interchangeable bodies. Or robots to decorate our Christmas trees. WellMedicated has put together a collection of 45 magazine covers depicting the space age "world of tomorrow" that for some reason or another didn't arrive. I'm sure that many if not most of these images evoked a "golly, would you look THAT!!" reaction back in the day, but in retrospect the majority of them are now just downright ridiculous (I mean: water polo with mechanized polo horses? Seriously?). Mucho thanks to friend and fellow blogger Shane Thacker for a great find!